At Last The Secret To Piano Lessons for Beginners Is Revealed ! 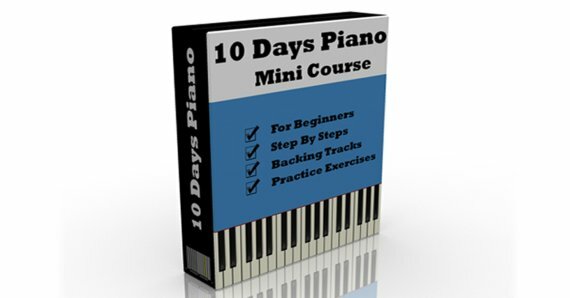 With this Piano Course you can teach yourself piano in 10 Days or less. The course contains Piano ζessons ƒor βeginners & mainly focuses on piano chords for beginners, by doing so, it increases your ability to play piano by ear. Most of the people wants to know how to play piano by ear, and this course is the answer to it. Although anyone from age 7 and above can learn from this course, this course was built for online piano lessons for adults. If you are working guy, attending to piano classes might be very hectic to you, this course will help you to sit at your home and learn at your own comfort. This course will be your personal Piano Teacher. These are easy piano lessons, with each piano tutorial in course you will improve your ability to play piano. By end of this course you will be able to play beginner piano songs. This is the best way to learn piano. Lesson 01 : Rhythm No. One - Left Hand Note Right Hand Chord. Click To Watch Video. This particular rhythm includes four chords, 1st chord is C major chord, 2nd chord is A minor chord, 3rd chord is F major chord, and 4th chord is G major. To play the C major chord, we need to find the C note, first you find the 2 black notes, and play the white note which is precisely next to this black note. I am using 88 keys keyboard, that’s my digital piano. So, this is my 4th C counting from left. So, after locating the C note, we will locate 2 other notes, for C chord. 1st one is C played by thumb, 2nd one is E played by middle finger, and the 3rd one is G played by last finger. Once C is located, we will play the next chord. A minor. To locate A minor, move this entire shape two notes to your left, notes for A minor chord are A C E.
Now we will move this shape two notes further to left. That gives me F major chord. Notes are F A C. Now move this entire shape one note to right. That gives me G major chord. Notes are G B D. Now we will memorize the shape of C, by playing it over and over. We will play this 4 times. Now slowly move your hand to two notes to left. Practice your A minor chord. Entire shape to two notes to left, F major chord. Now entire shape to right one note. This gives me G major chord. Practice 1 2 3 4. Let’s take a look at left-hand pattern. Left hand uses chord shape for F. The notes I will play are in this order, C A, F G. I am playing 3rd C from left, that is by my thumb, A with middle finger, F with last finger and G with ring finger. We will practice our bass line slowly. We will play each note 4 times. Now we will combine left hand and right hand together. First, we will play bass note with left hand followed by same chord, that is C chord by right hand. Do this slowly. Next step move your right hand two notes to the left and look out for A note on the left hand and practice these. This is A note and A minor chord. Now we will add one more chord in our progression, that is F major. We’ll play C 4 times, A minor 4 times, F major 4 times and now let’s practice all together C, Am, F and G. Now let’s practice with metronome. Metronome’s speed is 90. Let’s practice left hand with metronome. If you are struggling with this speed you can reduce your speed to 60 or 80. Now let’s combine both hands and practice with metronome. Let’s practice actual rhythm in a slow tempo, that’s 90. Now let’s practice with a backing track with a slow tempo 90. Now it’s time to practice with actual tempo with the backing track. First chord for this rhythm is C major chord, which is same as in our 1st rhythm. Notes for this are C E G , 2nd chord is G major G b d you can move 5 notes to your right, counting from C 1 2 3 4 5. 3rd chord is a minor chord notes are a C E, just move 1 chord to right. Next chord is F major, notes are F a C. Move 2 notes from a minor, that gives you F major. E minor chord is E G B which is one note left to F chord. And D minor chord is D F A which again is one note left to E minor chord. The right-hand rhythm pattern for this rhythm is like this, so what I did here is I played C major chord twice, then go to G chord, play it twice, then go to A minor chord, again play it twice, come back to F major chord, this again twice, this covers first part for the rhythm. The next part is similar, but it uses different chords, it’s like this, C G F once now I am playing two chords in one beat that is E minor and D minor. It’s like this and come back to C. Will do this slowly once again. Now we will see left hand pattern for this rhythm. Notes are in this order first one is C then I 've G that is with my index finger, then I’ll play a with my thumb, then I’ll play F with middle finger, next again C - G – F, hold it for two beats and then come back to C.
In real time it’s like this. To gather this rhythm sound like this. First, I’ll play C note by left hand, and at the same time I going to play C chord, 2nd beat i am playing only right hand. So, it’s like this one more time you see, then go to G - G note with G chord, and a minor with a note, come back to F.
This is my first line. Second line is like this C - this was G - F and now hold this left-hand F and play two chords, that is E minor and D minor in one beat. It’s like this, one more time we will play it. Come back to C. Now let’s practice right hand with metronome. Tempo is 70. Now its left hand with metronome, tempo is 70. Let’s do both hands with metronome. Now let’s practice with backing track. Tempo is 70. Now it’s time to practice with actual tempo. Actual tempo is 90. This rhythm uses same chords as in our 1st rhythm. Chords are C major, A minor, F major and G major. Right hand pattern for this rhythm is like this. What I am doing is, I am playing C twice, A min twice, F twice and G twice. This is getting played on every 2nd and forth beat. Bass line follows this steady pattern. Bass notes are alternating between 1st and its 5th. So, if I take C as my root note, its fifth is G, but instead of playing it here, I am playing it backwards to the left of C, so it’s actually a 4th note from this C, so bass line is like this. It is getting played on 1st and 3rd beat. The pattern goes like this for both hands together. Now this whole pattern is replaced by remaining chords. But we will see that in detail. For A minor chord the bass line is A and E, so I am playing ... Then I am playing F which is F and C and for G .. G and D.
This rhythm uses same chords same four chords as in with our previous lesson. Chords are C G Am F. This time the order is different. In this rhythm we are splitting the chords note in this style, so what I am doing is I am playing the whole chord, then I am playing the root note, then I am playing 2nd and 3rd note together and again back to root note. Slowly once again we will do this. While counting you can count this as 1 and 2 and then shift the whole pattern to G chord, come to Am and F. Bass line for this follows the chord progression C G A F it played for two beats. This rhythm uses only 3 chords, its C F and G. This rhythm is written as shown in the screen. C/B, that means C chord your right hand and B note by your left hand. It can be written as C / A also that means C and A. C / G means C and G on bass. Right hand follows this rhythm pattern. What I am doing here is I am playing a chord on each beat 1 2 3 4 then move to F chord, and last chord is G and come back to C chord. Left hand uses this pattern. So, what I am doing is I am playing C B A and G over C chord, timing is like this. 1 two &. when the chord changes, my entire pattern shifts to right and plays notes F E D C, that’s over F chord. After that it moves to G and play the notes G F E D and come back to C note. Together it sounds like this. I'll play first and then I'll explain. So, what I am doing here is I am breaking the chord into 1st, 5th and octave, I am playing C G and C with left hand. The fingers are like this, 5th finger, index finger and thumb, at the same time holding pedal and with my right hand I am playing notes D and E and again D, C G. one more time we 'll do it slowly. On 88 keys keyboard I am playing this 3rd C, and I am shifting the whole pattern for Am chord, it’s like this A E A, right hand uses B C , then shift whole pattern to F the notes are F C F and right hand notes are G A then move on to G notes are G D G, right hand uses A and B and come back to C. To sum up its like C two times, Am two times, F once and G once then back to C twice. This pattern uses 3 chords, C F and G. Let's see the right hand pattern, for each four beats I am playing like this, 1 & 2 & 3 & 4 & on each & I am playing a chord and on numbers I am playing these notes, we will see that in detail. But first let’s finish the right hand. so, what I am playing I am playing 16 times C then moving to F I am playing 8 times coming back to C. C is again 8 times then 4 times G, 4 times F and 8 times C. Slowly it will be like this. Let’s see the left hand pattern, left hand uses notes C E G A Bb A G E its played twice. then moved to F A C D Eb D C A and come backs to C E G A Bb A G E. pattern for G chord is G B D E then move to F, notes are F A C D and come back to pattern of C. let’s see how to play both hands together, after every left hand note, right hand plays a chord. This song uses 3 chords, its C, F, G and in the end, it uses C's inversion. We'll talk about it later. Let's see the right hand melody first, it’s basically a C major scale in reverse order, but it has got a particular tune. First, we'll see, it’s like this. Notes used are in this order C B A G F E D C. this is probably the easiest song you'll ever learn. one more time we'll play the melody. Next part is like this notes I am using are G A A B B C. Now take a look at chords in detail. first chord I use is C. Let’s take a look where the chord changes, Hit the C chord when you hit the C note and one more time hit it when you hit G note. and then later on when you hit this E, same time you 'll hit C chord. Last time it’s with C note. Next part uses what I am playing is F chord with this melody, so A and F chord are played together. play chord one more time, when you hit this B note, you'll play G chord, play chord twice and then C note with C's 2nd inversion. let's see a trick on how to remember all the 24 major and minor chords. That's like 12 major chords and 12 minor chords that makes total of 24 chords. These are chords that are useful for you, know playing songs, I mean many songs so, first we will take a look at major chords. So, I have grouped the major chords in categories. So, let's see the first category. first category is major chords with all white notes. They are C F and G major. So let's take individual notes of chords, C major uses note C E G. F major users F A C. G major uses G B D. So, these are the chords which have all white notes. You practice these three chords first C F G.
The second category is the chords which have two white notes at the end and one black note in the middle. It's like this, they are D major, E major, A major. So D major uses the notes D F# A. E major uses E G# B. A major uses A C# E. You can practice these three chords. Now the next category is the chords which have two black notes at the edge and one white note in the middle. These chords are Db Eb Ab. So, Db is same as C# but for certain reasons we call it Db chord. Db chord notes are Db F Ab. Eb chord notes are Eb A Db. Ab chord notes are Ab C Eb. Now you practice these three chords. That's Db Eb Ab. Eb chord has another name as D# chord and Ab chord has another name as G# chord. The next category is where all the notes are black notes, that chord is F# major or we call it Gb major chord, which uses all the Black Keys. The notes are F# A# C#. This is only single chord with this category. The next category is one white note and two black notes, this category has also one chord which is B major chord. B major Chord uses notes B D# F#. The next category is one black and two white notes, that's a Bb major chord. Notes for Bb major chords are Bb D F. Another name for Bb chord is A# major. You can call it A# major also. Now you will practice these three categories separately. All black note chord is F# major, then one white, two black is B major and then last category is one black two white is Bb major. Now let's see how to turn a major chord into minor chord by just moving one finger. So, the simple trick is this, you first find out the major chord. Let's take example of C major to make it a minor chord, just move middle finger one note to the left, that note might be white or black note, in this case it is black note. This is C major chord and to make it a minor, I just moved my middle finger and put it on Eb note, becomes E minor. You can try it with D major chord, the D major chord, in this case the next note is white note, so I move my middle finger to this F note, that makes it D minor chord. So now you know the trick for finding minor chord. Let's take a look on all major chords and minor chord. so first we play all the white note chords category, that's C it is my C minor. The next is F, this is my F minor G, G minor. Next category was two white notes and one black note in the middle. So, this is D major to make it minor, this is D minor. E major, E minor, A major, A minor. Next category was two black notes and one white note in the middle, so this is my Db major, Db minor. Next is Eb major, Eb minor. Next is Ab major, Ab minor. Next category is all black notes chord, which is F# major, this is F# minor. Next category was one white and two black, this is B major and B minor. Next category was one black note, two white notes, so we have Bb major, Bb minor. Practice all these chords. Thanks for the comment. Keep Looking website for more Free Lessons! Thanks for sharing free lesson.. Looking forward for a pdf version 🙂 great video! The free piano lessons are very helpful for a beginner. Very helpful lessons for beginners… encouragement to self learners! Hello, hi everyone, how are you all? This is a good thing, like a free Piano lessons. I think some more free pianos lessons should be added. Good one. Keep it up. i am very happy to attend your piano study. Thanks for the feedback. I am working on chords pdf..
i am a total beginner and want to learn the joy of playing the piano ! got thousands of songs in my head and want to put good melody on them!!! Have you subscribed for my mini piano course yet? I am a bigginer and would like to learn but I see on 3-4 lesson and could not see more lesson. I would love to get all of you videos for a price if any. Please let me know how to get that complete course videos. I also dont see your email address to contact. Your reply will be appreciated evn it is thru your comment page. you’ll receive total 10 free lessons, once you’ve subscribed to this website, you’ll also get purchase link to purchase more than 200 lessons.. pls subscribe to this website by putting your name and email id and click on send me lessons..
Do you have your Weired (sic) Trick to Remember Chords on paper or something I can print?